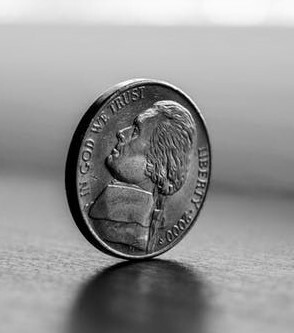 How, you may or may not wonder, does a person get to a grandparentish stage in life without ever having learned the proper way to flip a coin? I dunno, actually. Maybe because, not having either an allowance or opportunities to spend money as a child (you don’t run down to the store for a bottle of pop when the nearest store is 15 miles away), I never had coins in my pockets. Maybe because, with an older sister to tell me what to do, I didn’t need to make all that many decisions. Maybe because, not having brothers, I didn’t learn the skills for games like marbles or bottle-cap flipping that were considered to be for boys. Of course, I didn’t learn to play jacks either, which tends to weaken that theory. Maybe because, as I got older, coin-flipping seemed like one of those life skills—like playing softball or flirting or being able to instantly tell one Beatle from another despite their identical haircuts—that everyone else already knew as a matter of course but that I had somehow missed. No doubt because I was off somewhere reading a book when the instructions were handed out. But finally, this particular small deficiency in my skillset has been remedied by a five-year-old eager to show off a cool skill he had just learned from his father. With a little help from his younger brother, who strongly urged me to open one of the beers in his parents’ fridge in order to get a bottle cap of my very own. Fortunately, this solution became unnecessary when the five-year-old rummaged in the recycling bin and excavated the green cap. I’ve carried it in my car ever since. I categorically deny that the reason for this is my rather casual attitude toward automotive hygiene. I keep it as a reminder of the earnestness of my little cap-flipping instructors. And also as a reminder that making decisions—something I’ve had trouble with all my life—doesn’t have to be such a big deal. All you have to do is pick heads for one choice and tails for another, then flip a coin. Which now, having been trained, I know the proper way to do. Then—here’s the important part—before it comes down, notice which way you hope it lands. And tadaa! You have your answer. Simple, really. Even a five-year-old could do it. Yeah, simple. But how do you decide which is heads and which is tails? Oh, no! You mean there’s more to this? And just when I thought I was doing so well . . .